The Star (R) says you are out of touch with your reality – caught up in the past and this pessimistic attitude will narrow your relationships and cut off any possibility of renewal. Contemplate your past mistakes – put things into a proper perspective. When you feel a sense of hopelessness, and experience a lack of self – esteem – recognize that all is not lost. Be receptive to this spiritual blindness – understand that it can prevent you from seeing or taking advantage of new horizons. Masking itself as arrogance – you become cold, uninvolved, uncaring and ungiving. You experience weakness and fear – closing yourself off from the spiritual channel of calm and hope. The waters of life become dammed up inside and the outside becomes tired and depressed. Go deep within, seek spiritual guidance and through meditation you will see your world in a new light. You will receive “direct perception” as the love in your mind creates peace, joy and illuminates the possibilities. Join forces with your True Self now in a journey filled with grace. At one extreme, we have pessimism; at the other extreme, there is over optimism. If pessimism dips low into depression, despair, complete lack of hope, then there is need for outside help. This reading itself may be a sign from God for the readee to seek such help. There may already be more information than you have been able to process on your own. Such an overload, if not handled, can lead to serious mental, emotional, and/or physical problems. Under normal circumstances, and certainly in metaphysical matters, you do not intervene unless requested. Requests need not come in words, and in this case an overt call for help may be beyond the person’s ability. What aspect of your life is being purified or cleansed? What are you inspired to do? For what are you receiving recognition? What are your ideals in this matter? In the first position: You may have extra work with those who have the longest road to travel from pessimism to optimism, with those who have the least expectations from self rather than the most. In the second position: You may be working on an old idea, or a broken dream that has Outlived its usefulness. Look for new additional sources of validation. You have tried for the payoff a bit too early. In the third position: Look at your long-range goals. They may be inappropriate for this lifetime. Review Karmic Contract for your strengths and predispositions, your talents. There is such a thing as picking a goal that is out of reach. For instance, very short men should not aspire to becoming professional basketball players, but maybe a coach. In the fourth position: This can be a fascination with success and its attendant glamour, but without the expectation that you will achieve it personally. This could lead you to a profession that keeps you near the inner circle but not in the spotlight yourself. At the other extreme, you may be obsessed with stardom in its abstract and unrealizable form. 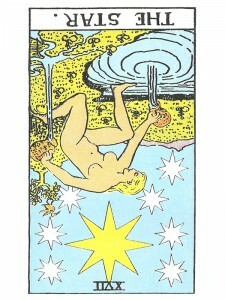 In the fifth position: At one extreme, there is disappointment, pessimism. But at the other extreme, there is too much optimism for the question at hand. Don’t overshoot. In the sixth position: This can be the effect of a mental disappointment, or general mental malaise on your emotional plane, your relationships, and creative output. In the seventh position: You may exhibit one or both of these extremes, vacillating back and forth. On the one hand, there is a fear of exposure and publicity, of success. On the other hand, there is the easier to understand fear of failure. In the eighth position: You may be living in a dream, avoiding reality. Or, your plans have just gone up in smoke. In the ninth position: The heart may not be in favor of the program. or, the heart is neglecting much of its own business to support the mind’s programs. In the tenth position: Your success will be strategic to, and/or dependent on, that of another. Your Karmic Contract is closely intertwined with others and you should be able to work consciously with this fact from now on.